When I stand in my Canadian shoes, I am an ardent supporter of fair trade – comercio justo as it’s known here in Honduras. Count me in for any practices that try to help small producers in under-developed countries make a decent living from their coffee crops and such. But when I look at fair trade from the perspective of Hondurans, things get a little muddy. That’s especially true around the question of prohibiting child labour. Taking steps to stop children from being forced to work to produce goods for the developed world is, understandably, one of the most fundamental principles of fair trade. Back home in Canada, I took pride in paying more for fair-trade coffee, believing that the extra cost was worth it if it ensured that some struggling family somewhere in the world earned a bit more for their coffee crop and didn't have to send their children into the field like tiny slaves. But like I say, it all just gets a little less clear once you look at it from the Honduran perspective. Beans, corn and coffee are easily the three most important crops for poor rural families in this part of Honduras, the west. The first two keep a family fed. The third – coffee – generates pretty much the only cash many of the families will see over the course of a year. Rural Hondurans are quite good at living a very nearly cash-free existence, but coffee is a treasured “money crop” because it pays for all the things that even resourceful Hondurans couldn't otherwise access - like schooling, health care, shoes, laundry soap, electricity, purified water, transportation, household emergencies, vet care and animal feed, to name but a few. In other words, coffee really matters. And fair trade really matters, too, because as always the producers are the ones who make the least money by the time coffee beans go from their fields to your cup at a high-end specialty café. I once crunched the numbers to get a sense of the difference, and it turns out that a nice cup of coffee at your favourite café sells for roughly 100 times the price that the producer got for the beans that went into that cup. So yes, an organization that certifies producers to ensure they make more money in exchange for adhering to better agricultural and hiring practices – what’s not to like? But there’s the theory of fair trade, and then there’s the reality. For instance, child labour. Given that more than 80 per cent of coffee producers in Honduras are small one-family operations, everybody in the family has to work when the harvest is on. And for the really poor families who don’t even own land, it’s even more important to hire the kids out to producers looking for extra hands during the harvest from October to February. The public primary schools shut down for a two-month vacation in December-January specifically so children can work in the fields. 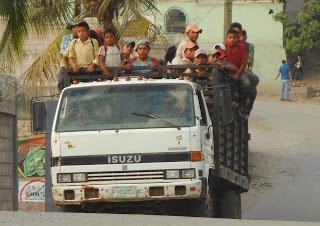 When the coffee season is on, giant truckloads of children being driven off into the hills around Copan Ruinas or even to nearby Guatemala is a routine daily sight. It’s child labour, there’s no doubt about that. In an ideal world, these kids would be in school rather than working. But it’s also the only way that a lot of Honduran families can make it through the year. For mothers with small children, taking their kids along for a day of picking coffee is often the only option if they don’t have anyone to look after the child while they work. For these families, the well-intentioned fair trade prohibition against child labour looks very much like a threat, a risk to their livelihoods. If all the growers in Honduras actually stopped using child labour, the result would be disastrous for so many people. From a Honduran perspective, prohibiting child labour actually increases the risks for children. Nor is the certification process easy, or cheap. Some of the small co-operatives have figured things out, but it would be difficult if not impossible for a small independent producer to get certified. And yes, fair-trade beans fetch a higher price on the market for producers. But meeting the requirements for fair-trade or organic designation also means higher costs. Last year, a local fair-trade-certified coffee co-operative here in Copan also learned the hard way that buyers sometimes just declare they've got enough fair-trade product for now, leaving producers to sell on the regular market regardless of the extra time, work and money they've put in as certified growers. And please, continue appreciating the principles of fair trade, and the good work that the movement has done in under-developed countries. It’s just that like everything else in this world, doing the right thing is more complicated than just buying into a brand. As an ardent fair-trade, no sweatshops, etc consumer, I often find it hard to know if I'm just seeing the world through rose-coloured glasses. We do drink Level Ground for the very reasons you define, but it makes me think about how much deeper we need to research. Thanks, Jody, for all your posts and photos. You always move me - to act, to think, and sometimes to tears. I think it is important to allow families the right to choose if they allow their children a chance to work. I do not believe in anyone government or otherwise telling people,good people what they can and cannot do to survive and it is obvious these families are not abusing anyone only trying to live a normal healthy life. We have bought fair trade for years, for the reasons you state, but honestly had little idea of the other side of the matter. And the other side, from the Honduran perspective, makes sense. And, of course we also buy fair trade to assuage our guilt and to hope that our cuppa joe isn't exploiting too many people. I honestly don't know, in the Comox Valley, where we would access the coffees of which you write. Always food for thought, Jody. We have a volunteer group on Salt Spring Island who buy directly from a co op of coffee producers on Ometepe island, have the beans roasted locally and sell the coffee. We pay the growers about twice the "fair trade" price and return all the revenue that we generate from sales back to Nic and Guatemala for a variety of development projects. Youngsters on the finca help with the sorting of the beans. They don't act like slaves any more that we did as kids helping out around the farm or household. WE call our coffee Ometepe in honour of its source. Thank you Jodie. Having raised our children in the wilderness - where they grew up living and loving the rhythm of nature and seasons and the responsibilities of survival - here in BC - I have a great respect and admiration for families that work together on the land and in family businesses. In Victoria BC - Fantastico knows their coffee growers personally. They aren't certified organic fair trade because the coffee growers are small family operations and they can't afford the certification but they are organic. If we as consumers ask our coffee shops what they know about the families and farmers whose products they sell - we quickly can perceive which coffee shops are actually involved in ethical and 'fair trade' with the people who are growing. It is one way we in the north americas can participate in the well being of the growers of our food everywhere. Get to know our farmers or buy from businesses that honour and know their growers - whether it is local produce or products from far away. Buying ethically raised food may cost a bit more out of our pocket books but our hearts and souls will thrive as we begin again to feel the wealth of nourishment, flavour and love that goes into what we eat and wear. Thank you for this insightful post. There are a number of groups working on this including a very interesting project in La Union, Lempira - http://www.unionmicrofinanza.org. There are a number of groups that do this in El Salvador and Guatemala. I have a number of people in Iowa interested in doing this type of comercio directo or comercio solidario, but I'm still not sure how they might do it.